Conference facilities equipped with state-of-the-art digital equipment. Lesedi offers a full range of both day conference packages, as well as highly recommended and totally unique overnight experiences in the luxury themed accommodation, located in one of five traditional out of Africa villages. Sumptious eating experiences and energetic evening entertainment are additional value adds to the overnight packages. Truly African teambuilding activities compliment the conference packages. 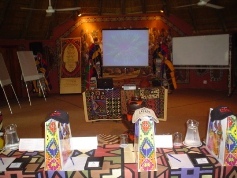 Lesedi has a selection of 3 conference venues and 2 function rooms to choose from. Lesedi will breathe new life into company conferences, functions and special events, incorporating a kaleidoscope of cultural colour and passion. Lesedi offers a unique experience, found in the Cradle of Humankind, a World Heritage Site, only 45 mins from Jhb and Pta.